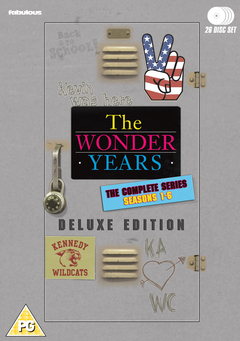 For six seasons, The Wonder Years captured the angst of growing up in suburban middle- class America in the late ’60s, as seen through the life and times of Kevin Arnold (Fred Savage). Audiences eagerly followed his evolution as a typical teenager who remembered every moment of his transition from childhood with excruciating detail and remarkable hindsight. The set also includes every single original song as it was featured in the original broadcasts, with classics by Jimi Hendrix, The Byrds, Joni Mitchell, The Monkees, Steppenwolf, Smokey Robinson, Bob Dylan, Aretha Franklin, The Temptations, Cream, Simon & Garfunkel,, Diana Ross and the Supremes, James Taylor, Nat King Cole, The Beach Boys, The Who, The Righteous Brothers, James Brown, Jackie Wilson, Aretha Franklin, Marvin Gaye, Bob Seger, Bachman-Turner Overdrive, Sonny and Cher, Bread, Creedence Clearwater Revival, The Four Seasons, Sly and the Family Stone, Ben E. King, Stealers Wheel, The Rolling Stones, Grateful Dead, Tammy Wynette, Eddie Cochran. Over 23 hours of exclusive bonus material, featuring, The first cast reunion in 16 years, Interviews with the creators, cast and crew. 10 newly-produced featurettes. Never-before-seen outtakes of Kevin and Winnie’s first kiss! Season guide booklets crammed with notes on the show..
Michael Dinner, Ken Topolsky, Peter Baldwin, Daniel Stern, Steve Miner, Nick Marck, David Greenwalt, Arthur Albert, Jeffrey D. Brown, Matia Karrell, Jim McBride, Thomas Schlamme, Greg Beeman, Tom Moore, Andy Tennant, Bethany Rooney, Rob Thompson, Bryan Gordon, Neal Israel, Richard Masur, Stephen Cragg, Carol Black, Neal Marlens, Arlene Sanford, Art Wolff, Peter Horton, Dan Lauria, Peter Werner, Lyndall Hobbs, Nancy Cooperstein. Fred Savage, Dan Lauria, Daniel Stern, Alley Mills, Jason Hervey, Josh Saviano, Danica McKellar, Olivia d'Abo.